With a stay at OYO 1144 Hotel Royal Sun palace in Bhopal (Maharana Pratap Nagar), you'll be within a 15-minute drive of Birla Mandir Museum and TT Nagar Stadium. Featured amenities include complimentary newspapers in the lobby, dry cleaning/laundry services, and a 24-hour front desk. Event facilities at this hotel consist of a conference center and a meeting room. Free self parking is available onsite. 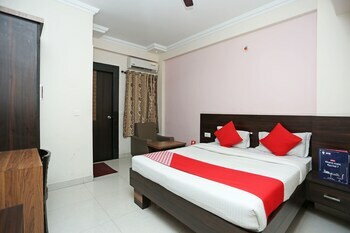 Located in Kota, OYO 2689 Indra Vihar is within a 15-minute drive of Jag Mandir and Kishor Sagar. Featured amenities include a 24-hour front desk and luggage storage.